The dream of getting a direct place in World Cup ends here for Indian Women’s Hockey. 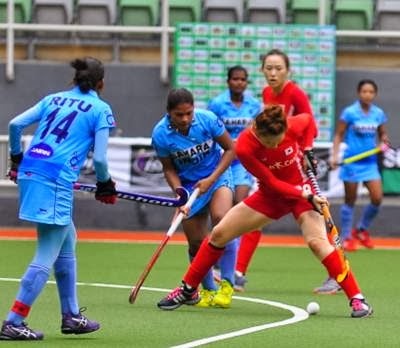 Today India Women’s Hockey team lost the semi-final with South Korea for 1-2 in 8th Women’s Asia cup Hockey at Kuala Lumpur. By losing this match, India’s dream of playing World Cup next year has been crashed. In men Asia Cup too India lost at the finals to South Korea. Today’s match was quite interesting because South Koreans made early goals and made India under pressure within 10 minutes of the game. Two goals have been made in penalty corners by South Korea in 9 minutes. First goal made by Cheon Seul Ki at the 2nd minute and the second goal made by Cheon Eun Bi Min at the 9th minute of the game. Indian team looked quite shocked of two early goals but they couldn’t make any score at the first half of the game because South Korea played a defensive play after their 2 goals lead. The second session started and, India were in the situation to make their way and finally India made their first goal at 41st minute. The first India score was made by Ritu Tani in a penalty corner. Then India were eager to level the score but they failed to do it. The game finally came to the end for 1-2 where South Korea defeated India and entered finals of Asia Cup. India dropped the dreams of making their way in World Cup to be held at Hague, Netherlands by next year. Now India will play bronze medal play-off match tomorrow(Friday) with China. In the finals South Korea is going to meet Japan, which defeated China for 4-1 in another semi-final. The final is scheduled for tomorrow(Friday). South Korea who have already won three Asian Cup are going to face a tough finals tomorrow because Japan have defeated highest ranking Asian team China in another semi-final. Considering the FIH rankings, China stays at the seventh place and to be the top Asian team. India is at 12th place. The 8th women’s Asia Cup Hockey final competent Korean at eight place and Japan at ninth place. Readers get ready for the finals of the Women’s Asia Cup Hockey by tomorrow and share your views.